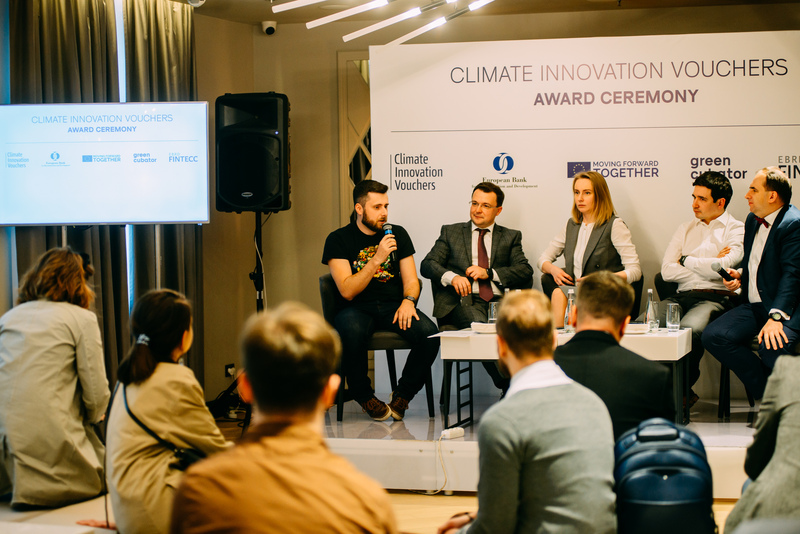 On the 10th of April, European Bank for Reconstruction and Development, the Delegation of European Union to Ukraine and Greencubator announced the winners of the 5th stage of Climate Innovation Vouchers program. A panel discussion on financing for climate innovations in Ukraine proceeded the award ceremony. Roman Zinchenko, Greencubator co-founder, was a panel moderator. The panelists pointed out that cleantech developers face the same issues when looking for funding, as most tech startups. However, as Andriy Sorokhan, Venture Lead U.Ventures/ Western NIS Enterprise Fund noticed, there are not enough experts familiar with climate innovations, benefits, and risks of green investing. 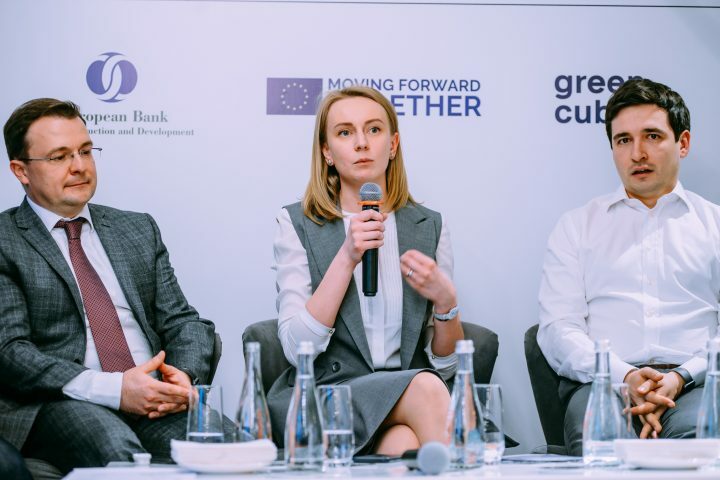 Svitlana Kolomiets, an environmental policy expert, co-founder at ReThink NGO, emphasized that the Ukrainian business market should pay more attention to the entrepreneurial culture. It is crucial for forming the green business industry and ecosystem. She also stated we need to develop human resources and work more intense with personnel. Roman Kravchenko, the founder at accelerator laboratory IoT Hub, who has invested in several Ukrainian cleantech products, specified the lack of team-building relationships in startups’ culture. Judging from his own experience, he noted that this issue can be solved by the storytelling from real Ukrainian companies. That will help share knowledge and experience. Summing up the discussion, Roman Zinchenko pointed out that the development of entrepreneurial culture and the formation of the ecosystem is one of the main tasks of Greencubator. By the efforts of the team, Ukraine became the first country within EBRD operation area, to launch the Climate Innovation Vouchers program. Recall that earlier we announced winners of the final stage, and a list of all companies that have received grant funding from the EBRD and the EU for green development is available on the program’s website. 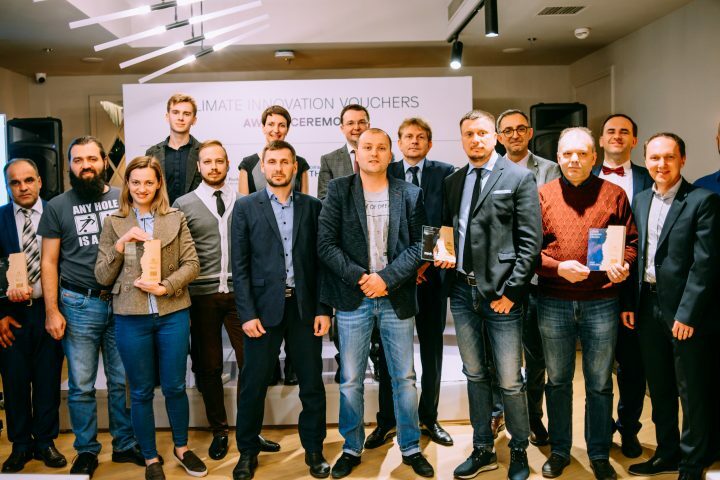 On the 10th of April, European Bank for Reconstruction and Development, the Delegation of European Union to Ukraine and Greencubator announced the winners of the 5th stage of Climate Innovation Vouchers program. A panel discussion on financing for climate innovations in Ukraine proceeded the award ceremony. Delfast — electric bikes certification and patenting, technical and usability improvements. Integro-SD — control and automation system for the proprietary organic fertilizers production line; certification. Integral Complex Systems — Low-power long-range wireless solution for energy systems control and data exchange. IOT TRADE — control system and web-interface for company’s central hub for smart-home devices (thermostats and sensors). Obolon Oil — industrial scaling for serial production of mobile waste plastic-to-fuel processing complex. This stage completes the first phase of Ukraine’s largest grant program for cleantech and low-carbon technology developers. During the five waves of the program, 31 beneficiaries received funding for the development of their green business solutions worth a total of 1 million euro. Climate Innovation Vouchers program is launched as a part of the EBRD program “Finance and Technology Transfer Centre for Climate Change” (FINTECC), funded by the European Union. Ukraine became the first country within EBRD operation area, to launch such a program. The program is implemented by the NGO Greencubator. During the five stages 31 Ukrainian companies have received climate vouchers worth approximately 1 mln euro. Read more about the program and its winners on the www.climate.biz.